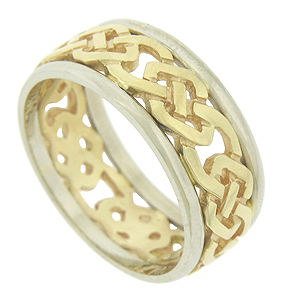 A bold, yellow gold cutwork chain framed by bands of white gold are crafted into this handsome mens wedding band. 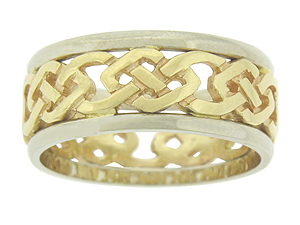 The antique style, bi-color wedding ring is fashioned of 14K gold and measures 8.74 mm in width. Size 9 1/2. We cannot re-size, but we can reorder in 18K, platinum and palladium. Contact us for current market cost.